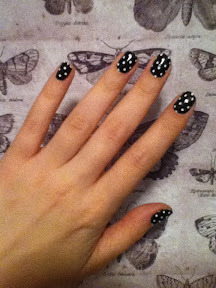 I love cute nail art, and I love anything that makes having cute nails easier. 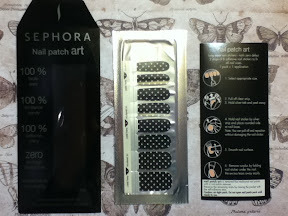 Nail polish strips seem to be getting popular, and are available from a few cosmetics brands now, so I decided to give Sephora's offering a try. 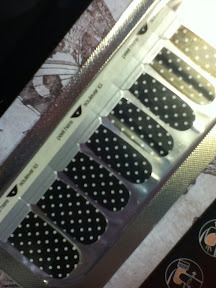 Sephora's version retails for 12.99$ Canadian, and I choose them in "My Favorite Skirt", which is a black base with white polka dots. Really cute! file to help with the application. 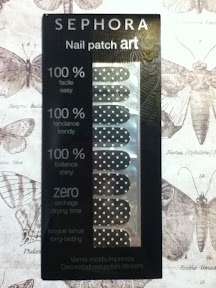 The application was pretty simple, they peeled off easily and the application was fine so long as I took my time. 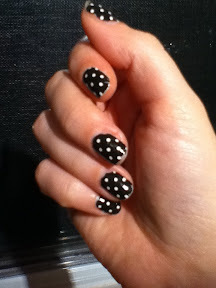 The finish is really shiney, which is great, but I noticed some weird "puckering" around the polka dots once they were on. All chipped off at the tip and cuticle. And on top of that, they're so hard to get off! You would think with how easily they broke off, it would be easy to remove them. Not. At. All. 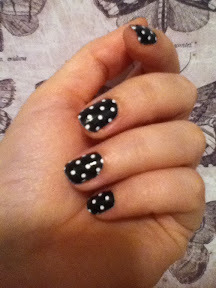 It took a good 30-45 minutes to remove these using professional grade nail polish remover. And I had to soak them in it. Honestly, for the price I expected better. If you don't mind the price, they might be fine for a day. Realistically there are better options.